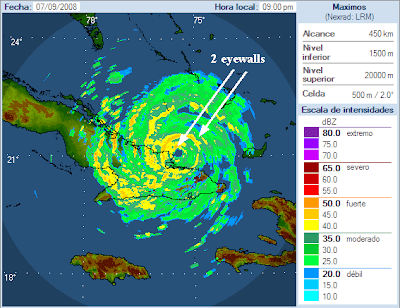 Hurricane Ike has been wreaking havoc in the Caribbean and is currently battering Cuba. At least 58 people have died in Haiti due to flooding resulting from Ike. According to the AP, over 319 Haitians have perished due to four separate tropical systems this season. Prior to striking Haiti, Ike slammed the Turks and Caicos Islands as a Category Four hurricane. Ike made landfall on Cuba as A Category Three hurricane with 120 mile per hour winds last night but has since been downgraded to Category Two. Over 900,000 Cubans have evacuated to higher ground which will undoubtedly save countless lives. Ike threatens to make a direct hit on Havana Cuba Tuesday morning. After crossing Cuba, Ike will head into the Gulf of Mexico and threaten the US coast.